— Like many of Carolina Youth Coalition (CYC) Fellows, Gloria, a second-generation immigrant, will be a first-generation college student. Like many of Carolina Youth Coalition (CYC) Fellows, Gloria, a second-generation immigrant, will be a first-generation college student. She is hardworking, bright, and inquisitive – and it was no surprise she applied to CYC on her own after seeing an ad on Instagram. What first stood out about Gloria was that her pursuit of education wasn’t just about herself. It was about bettering the life of her family. With a strong academic record, Gloria is the type of student who should have had a clear path to success in the college process. Yet, when they met her this was not the case, as she falsely assumed she had very few college options. What might have been perceived as a lack of ambition was simply a lack of exposure and tools to maximize her potential. After a semester in CYC, Gloria now has one of the most extensive college lists of any of their Fellows. Her list has grown from 3 to 16, with her sights set on colleges such as Davidson, UNC Chapel Hill, and Elon to name a few. After weeks of working on a personalized college plan with the Director of College Programs, Gloria began to expand her potential options. These options continued to elevate as she took full advantage of their weekly ACT program to increase her score by 5 points! Much of Gloria’s newfound aspirations is also attributed to the relationship Gloria has built with her CYC College Mentor, Chris, whom she meets with regularly. Darnley recalls, “When Gloria first started with us, she was behind where she should have been in the application process. 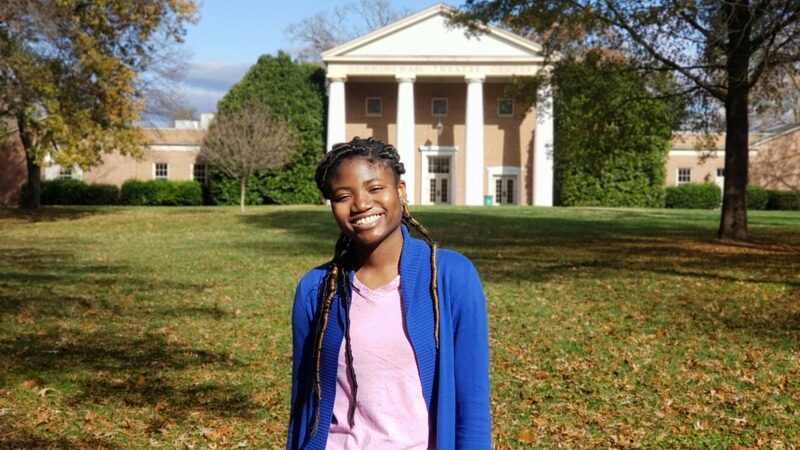 Gloria has been able to utilize Chris’ knowledge to broaden her college search beyond her immediate surroundings.” Davidson College tops her school choices after she had the opportunity to meet the college’s Director of Admissions during a visit to CYC. She later “fell in love with the campus and it’s people” on a visit to Davidson with Executive Director, Aaron Randolph. As she eagerly awaits her college acceptance letters at several places, Gloria is crafting plans to major in Biology and pursue a career as a Clinical Perfusionist. Building social capital does amazing things for our youth and changes our community as a whole. Carolina Youth Coalition's students, named Fellows, are empowered to leverage information, resources, and relationships to propel themselves to new heights. Access to social capital opens eyes and doors, expanding Fellows’ dreams of what is attainable alongside the support network necessary to make it a reality as well as changing the lives of those who are inspired by the young people they work with, like the staff at Carolina Youth Coalition. Carolina Youth Coalition's (CYC)'s mantra is “Every Dream Needs a Team.” When you surround the hopes and aspirations of youth with the right know-how, and know-who, there are no limits to what they can overcome and what they can accomplish. heTy prepare high-achieving, under-resourced students to enter, excel in, and graduate from college so they can be full participants in society. Their work requires a holistic approach to college admission and persistence that frequently integrates intentional opportunities for our students to build and nurture social capital throughout life.